Talk about making something out of nothing. Yaletown was once an area you did not really want to go to. Now it is the hottest area of Vancouver over the past 10 years. Built around 8 square blocks of old warehouses, this part of downtown is home to some of the hippest bars, restaurants, shops, and lofts in the city. There is also a large waterfront section to Yaletown more formally known as North False Creek. Now with nearly a hundred residenti al buildings, Yaletown is an extremely popular place to live. The boundaries of Yaletown are always being pushed by developers so their marketing schemes keep them in the vogue limits of this popular district. The old warehouse section goes from Nelson Street to Drake street and from Cambie St to Homer St. Now the spill out of Yaletown can go from BC Place all the way to the Granville St bridge along False Creek. If you are south of Richards and Smithe, it is safe to say you are in Yaletown. There are 2 great parks in Yaletown along the seawall in David Lam Park and George Wainborn Park (dog friendly). The seawall runs continuously along False Creek joining Yaletown to English Bay and making this a very popular area to start your run, bike ride, or rollerblade trip. 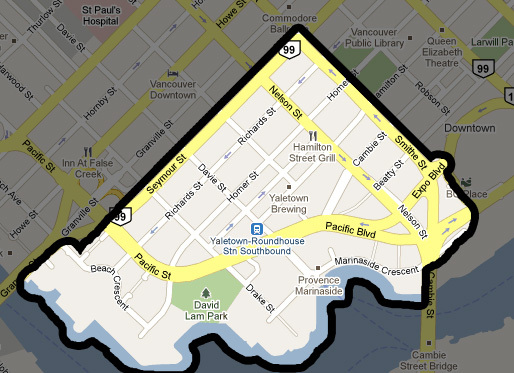 The only school in Yaletown is Elsie Roy Elementary School on Davie Street right near the seawall and David Lam Park. If you are between 20 and 70 years old, you will love Yaletown. It is a beautiful area of Downtown Vancouver that has literally been transformed.